You can find Laura online at laurashapirowriter.com, and her books What She Ate, Julia Child: A Life, Something from the Oven, and Perfection Salad are everywhere books are sold. After reading about this I became, frankly, obsessed. Luckly my family loves pancakes, so I had eager tasters for a few weekends at least. Tinkering about began on my 41st birthday, the age Eleanor was when, in 1925, Franklin had Val-Kill Estate built for her. 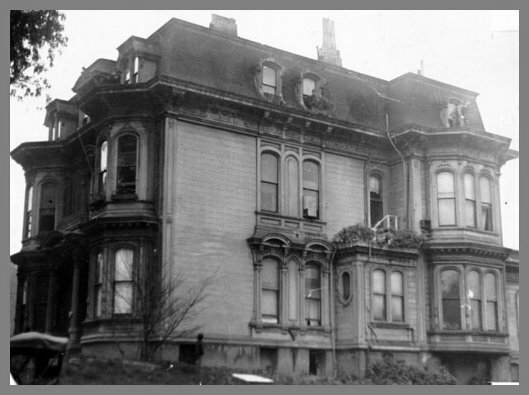 That was Eleanor’s home, the only truly her own, and where she spent the rest of her life following Franklin’s death in 1945 until her own in 1962. I like a clean edge for a more cake-like look so I use either a 9” cake ring to cut-out each individual pancake or trim away the thin bits with scissors. A 9” or 10” base-sized non-stick skillet works best for this. Melt the butter and set aside to cool to room temp. In the meantime, sift together the cake flour, baking powder, salt, and sugar. In a large bowl, whisk together the milk, eggs, and coolish butter, then whisk the dry ingredients into the wet. It’s okay if there’s a few lumps. Heat your skillet at medium and do a small test pancake. This one always, without fail, fails. Use 1 c (200 g) of batter per pancake, evenly spreading the batter over the surface of the pan. Let cook as you would a pancake of any size, watching for the edges to dry and bubbles to form over the entire surface, about two minutes. Use a larger, wider spatula to flip—I prefer a flexible fish spatula. Cook the other side for about a minute until browned. Adjust the heat as necessary to keep the cakes from burning before fully cooking inside. Slide onto a plate, cover to keep warm, and keep on keeping on until you run out of batter. Once you have your stack, do it Eleanor-style and sprinkle a few teaspoons of maple sugar* between each layer followed by a decent pour of maple syrup over the lot. I’ve also tried this with a generous smear of butter between each later; chopped up crispy bacon on top; and even Lemon Mascarpone Cream. Note, these are not huge, fluffy pancakes, rather a sort of hybrid pancake/crepe. If you want a loftier result, separate the yolks from the whites and fold in the stiffly beaten whites before cooking. Clouds of Mascarpone whipped up with a splash of heavy cream and lemon zest and juice to-taste. *Can’t find maple sugar? Make it! The (Second) Cake of the Episode: Laura’s answer to the end-of-episode question was to bake and share with her daughter a peach variation of this cakeish Magic Apple Plum Cobbler from genius Deb of Smitten Kitchen. I recently made a version using a mix of nectarines, blackberries and marionberries as well as another with strawberries and balsamic vinegar. The recipe is solid and amazing and pretty much my new favorite thing. Photo of Shomari Wills courtesy the author. Photo of Mary Ellen Pleasant via The Paris Review. Find Shomari Wills on Twitter @showills. Black Fortunes is available wherever books are sold! Pages from one of Mary's handwritten recipe diaries. With thanks for Sho! The Cake of the Episode—Pineapple Upside-down Pound Cake with Sweet Cream Lime Curd Ice Cream—in honor of Mary Ellen, Sho, and his grandmother. Smear every last bit of 3 T (42 g) soft unsalted butter all over the bottom and sides of a 9" cake pan. Sprinkle and press around the brown sugar. Circle the pan from the outside in with the halved pineapple chunks. Sift together the cake flour, baking powder, and sea salt. Mix together the milk and the vanilla extract. In the bowl of a stand mixer fitted with the paddle attachment, cream the remaining 8 T (112 g) unsalted butter with the shortening and sugar on medium-high speed until light and fluffy, about five minutes. Beat in the eggs one at a time, letting the mixer at medium speed for one minute between each egg. Make sure to scrape the sides of the bowl. Alternate the dry ingredients and milk/vanilla in three parts, beginning and ending with the dry. Spoon the batter on top of the pineapple, being careful not to nudge the sweet chunks about. Smooth the top with an offset spatula and set the cake on top of the half-sheet pan before putting the lot in the oven. Bake at 325° for 10 minutes, then increase the heat to 350° and bake for an additional 40–45 minutes until a toothpick inserted in the center (but not all the way down to the fruity bottom) comes back clean. Remove from the oven and set the cake pan only on a rack to cool. After 10 minutes, run an offset spatula around the edge of the pan to loosen the sides, then turn out the cake to cool completely. I used THIS recipe for the ice cream (sans vanilla) and THIS for the lime curd. I follow the genius Jeni's way of adding goodness to ice cream: alternate layers of ice cream with layers of curd in whatever container you plan to freeze it in. The Cake of the Episode! 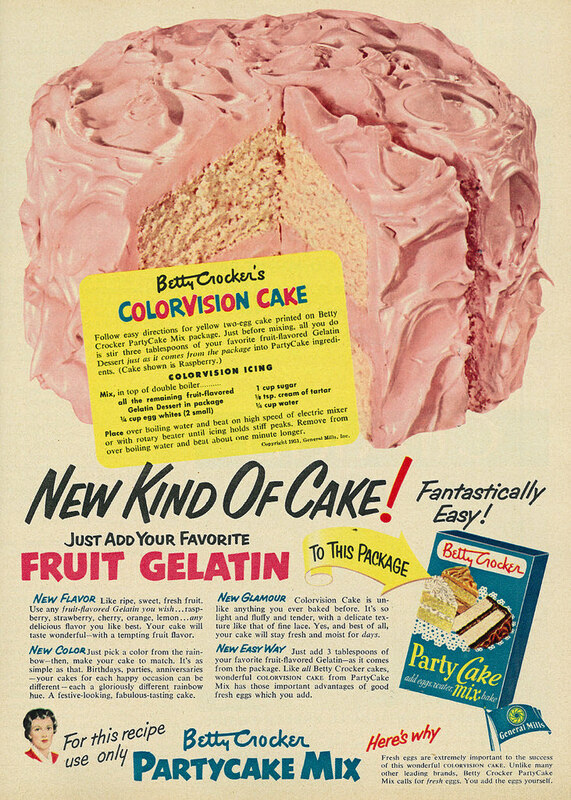 Silver Cake with Pink Frosting from The Vintage Baker. Photograph by Alice Gao. Cartoon mentioned at the beginning of the episode. A few booklets from my collection. Cake Secrets. (1953). General Foods Corp. I got so, so lucky (thank you Angie) with the immensely talented composer Alejandro Pinto-Hernández (website forthcoming) who kindly supplied original music at the last minute, and sent me files that I could use here. He and I will be working closely on the episodes to come, so expect more of his lovely, moody sounds. The plan is to have one "Cake of the Episode" with each show, some by me, some by others. Preheat the oven, then prep the pan by smearing 3 T (42 g) of the softened butter onto the bottom and sides of a 9" round cake pan. Go ahead and use it all, even if you leave some clumps. Over the butter, sprinkle 1/3 c (67 g) of the sugar, creating a thin layer, then spread the raspberries over that. NOTE: I used frozen and waited until the batter was ready before doing this, but it's up to you. In a small bowl, whisk together the cake flour, baking powder, and salt, and set aside. Put the remaining 1 c (200 g) of sugar into the bowl of a stand mixer, or in a large bowl if using a hand mixer, and rub in the 1 T of lemon zest. Add the remaining 8 T (113 g) butter and cream on medium-high speed until lighter in color and fluffy, about three minutes. Add in the eggs, one at a time, mixing well for 30 seconds between each egg. Don't forget to scrape the sides of the bowl! Add the lemon extract and sour cream, and beat until all traces of sour cream have been incorporated. Stop the mixer and fold in the dry ingredients gently, but thoroughly, until no streaks of dry are apparent. Spread the batter on top of the prepared pan and slide into the oven. 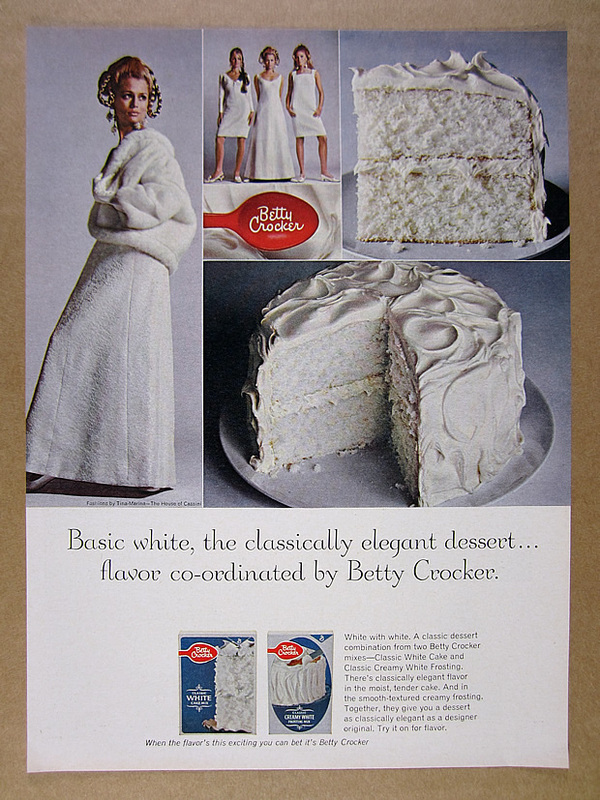 Bake for 45–50 minutes, until the cake begins to pull away from the sides of the pan, the top springs back lightly when touched, and a toothpick inserted into the center (but not all the way down to the fruit) comes out clean. Remove pan to a rack and let cool 10 minutes, then turn the cake out to cool completely. Gorgeous on its own, the cake keeps well, and gets a bit better with age, for a few days. Luster fades around day three. Finally, here is an outtake from the Podcast image shoot. It encompasses how I feel about cake and how I am approaching my work as The Cake Historian. Have a cake story to share? Don't hesitate to reach out! hello@thecakehistorian.com.